The Framed Lady: How often do you wash your sheets? This is a question for which there is no right answer. Some people (freaks, in my opinion) wash their sheets daily. To me, that is way more work than it is worth. Honestly, even weekly is too often for me. Conrad and I are both night showerers, so we slip into bed freshly bathed. In our case, our sheets really only need to be washed every month, maybe a little more often in the summer. "Every morning, on getting up, open the window wide, pull back the duvet or blankets and top sheet on the beds, plump up the pillows and allow the sunlight and air to get to the bed for as long as possible - the optimum period is about an hour, but if you have to leave the house in a hurry, just do it for as long as you can." 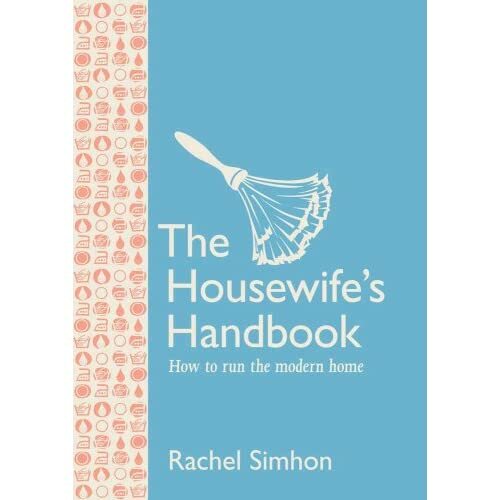 Now, aside from the book's super old-school, Stepford-esque undertones, its tips for cleaning and keeping house are pretty good. Our humid climate turns our house into a playground for mold spores, so airing the sheets out seems pretty logical to me. When you consider that heat, darkness, and moisture make it very easy for mold and bacteria to spawn, you can easily see that your bed may be the prime place for grossness. I'd recommend this book, simply for it's comical value. 1950's womanhood, wrapped in a 2007 cover. Bam. What are some of your household cleaning tricks? How often do you wash your sheets? I don't wash my sheets every weekend I probably wash them every other week depending cause I have sensitive skin so once my skin starts to itch it's time to wash. Lol. But I do clean every weekend sometimes twice a week because of allergies. You sound like a much better housekeeper than me! LOL I wash my sheets every 2 weeks. Sometimes once a month. It depends really. If my husband had been sweating REALLY bad that night, then I will wash them the following Sunday. Even if I already washed them (because his sweat STINKS soooooo bad). But lately because of that sweating problem, he sleeps on the couch where its FREEZING out in the living room so now I wash them 2 times a month or once a month... vs 4 times a month! Wow. I need this book!! I wash the sheets more during the summer when my husband and I tend to be a little sweatier, too. We have a fan blowing on us while we sleep, and our house never gets super hot, so I have to remind myself to wash the sheets. Wow! How do you remember? Part of the reason the sheets don't get washed a lot is because I simply forget about it. Also, I hate putting them back on the bed. I would say I wash ours at leas every 2 weeks. Depending on what season like you said and what we did. I can't stand certain smells, so if we have been at BBQ or a camp fire type of place, or even someplace where people have been smoking I wash them the next day! Clean sheets just make for such a happy nights sleep! Bonfires and BBQ's definitely stink up the sheets. Smoke sticks to fabric really strongly. LMBO!!! I love that you posted this! The last time I changed my sheets I thought I should write a blog post about it, haha! Anyways, I probably do mine every 3-4 weeks. And I have only two sets. I only have 2 sets, too, which makes me dread it more. It's upsetting how expensive sheets are. I'd buy more, then do laundry more often, but... you know how it is. Who in their right mind changes their sheets daily?? That is so much work!! I do mine every other week and dread having to change the sheets, but I do love snuggling down in bed with fresh smelling sheets. That's what I thought! And yes, fresh smelling sheets are the best. I love sliding into cold sheets on a warm night. Our sheets tend to get washed somewhere in between every 2 weeks or one a month... aka, I'm really bad at remembering when the last time they were washed was. Uhh thinking about changing my sheets daily gives me a headache & makes me want to pass out. I usually change mine every 3 weeks. I found ya on the blog hop. I hope you have a great week! Literal lol. So glad you're here! Wait you are supposed to change your sheets? I completely missed that memo.....dang it. It depends for me. Before kids weekly on the dot...now I try for bi-weekly if the laundry monster hasn't taken up all my time before hand. Oh wow- I do mine once a week (over the weekend) however now feel like I am washing them too much...but couldn't bring myself to do them any less, my husband's pillow case is already disgusting enough after just one week, let alone two! That's an interesting tip. It hasn't even crossed my mind to let the sunlight in. I usually wash my sheets every couple week. You're right... Every week is too much work!